I didn’t realize the extent of my decorating commitment phobia until I started ripping open packages of 3M’s Command products — suddenly, I am free from my phobia — I am hanging things up on my walls like a maniac all because of an ingenious line of products by the same people who brought us the Post-It Note. So, when JavaGirl managed to yank down the reindeer-stocking-holders-of-death (with their sharp antlers that scratched my face LAST year) from the mantle this year, I decided it would be safer for all of us if I replaced the pretty, yet hazardous, stocking holders with some Command hooks on our mantle. Although I had seen this done on their commercials, had it not been for the actual demonstration I saw at the hotel, I wouldn’t have attempted this on my own painted mantel. Lo and behold, all the stockings (even after being overstuffed by Santa!) hung by the chimney with care — and even withstood JavaGirl’s constant tugs. I moved on to put up two hooks at kid-height so the kids could hang up their coats — something I’d been meaning to do but wasn’t sure where I wanted to put holes in the wall… was afraid of hooks that might catch eyes or what not being so low… I had a bunch of reasons for not committing to that project. The beauty of the Command hooks was that I could try it out and if I didn’t like the idea, I could take them down without having to do a repair job afterward. And the hooks don’t protrude as much as other hooks so they didn’t seem as hazardous. I’m pleased to report the kids are doing a great job of hanging up their own coats when they come home. I was able to put up a temporary hook for our Christmas card holder and some other only-at-Christmas decorations. 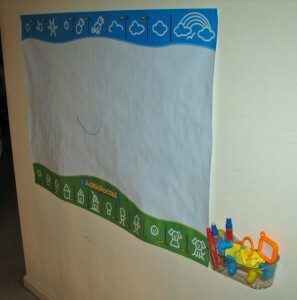 JavaGirl got a wall-mounted AquaDoodlepad for Christmas. 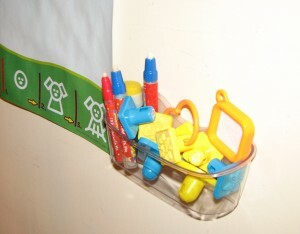 I ignored the gooey party tac stuff that came with it, mounted it with the Command poster strips, then bought a Command organizer bin to put all her assorted AquaDoodle paraphenalia (we have several AquaDoodle products) in one place. It’s a beautiful thing! My mother didn’t like us to have posters growing up b/c it would ruin the paint, and I was leaning the same way — much to my son’s chagrin when he got some coveted soccer posters. Now I have his Hooked on Phonics posters downstairs and his soccer posters upstairs all hanging on the walls, using the Command poster strips. I’ve already taken one poster down (when he completed a HOP level) and it came down easily. Mother and son can be happy. And finally — all those framed pictures and other artwork projects gathering dust because I haven’t gotten around to hanging them. I finally realized it wasn’t just about finding the time — it was both about my fear of wanting to rearrange the room and not wanting holes in my wall, and also my perfectionism (what if I hang it crooked?) Now, with the picture hooks and picture hanging strips, hanging things takes seconds and if you don’t like the end result, you can reposition or remove entirely very easily! I finally hung some artwork in my daughter’s room I’ve been meaning to do for 2 years. First I never got around to it just because I was busy. Then I didn’t do it because we were moving her from the crib to the bed. Then because I know we are about to get her a different dresser and will rearrange the room. But with the strips, I hung the artwork, knowing that when I do rearrange her room, I can very easily move the pictures as well and won’t have to spackle and paint! I actually had to dust off the magnet board and the white board I’ve been meaning to hang up in my home office — that’s how long they’ve been waiting to be hung up. EEK! 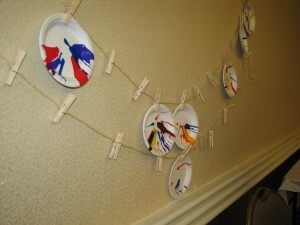 But a few picture hanging strips and VOILA – they are up and in use! The products aren’t as cheap as just using nails, but you can find coupons on their web siteand apparently there is a way to sign up for coupons and free samples. You can find Command products at most of the “mart” type stores (K Mart, Target, Wal-mart, etc.) and I’ve seen them even at grocery stores and drug stores. There are a lot of tips and ideas on the 3M web site as well, I haven’t even been to them all. Command is a trademark of 3M Corporation. AquaDoodle is a trademark of AquaDoodle. I discovered these over the summer and they have been my best friends ever since. I feel a little guilty over the expense, so I’ll check into the coupon thing. Thanks for the tip. Thanks for the tip! I didn’t know that there were this many types (like the poster strips) or that they’d hold heavier things. Granted, I’m pretty cool with putting things on the walls ;]. These are really awesome for business, too. If you have offsite meetings and want to put up posters or flip charts, etc. no more struggling with floppy papers on the walls and masking tape and hoping that you won’t damage conference room walls! I had had my doubts about this product. Now I have a way to hang the attendance poster for the kid’s Sunday school class. The room is a multpurpose one and holes in the walls were not an option. Thanks for the specifics about the product. LOL, I hadn’t even seen this comment — it’s true, I hate not having some on hand “just in case” — especially with small kids in the house. Little kids always seem to want to hang something up.